Do you remember this trick question from grade school: Which weighs more – 5 lbs of bricks or 5 lbs of feathers? Some of us (self included) were initially fooled by this obvious test of common sense, but as it relates to your content marketing, should you be focused more on building substantial content productions or presenting your audience with a steady array of minute snippets that define your brand and message? 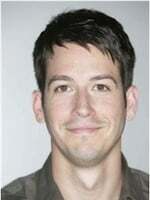 Bricks are larger content productions such as research reports, events, white papers, video series, mobile apps, etc. They typically require decent budget and time to produce but have the potential to make a larger splash when executed and promoted correctly. Feathers are comprised of simple text and photo content published via popular social media tools like Facebook, Twitter, LinkedIn, Google+, Pinterest, etc. Less intensive than bricks from a production budget standpoint, feathers are created consistently to maintain an ongoing stream of communication between a brand and its audience. 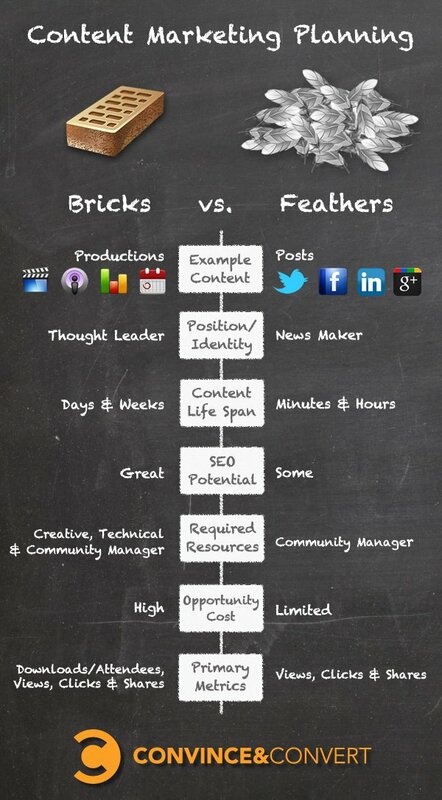 The graphic below illustrates the key differences between bricks and feathers for content planning and production. Here’s an more detailed explanation of the attributes you should consider. While there are varying degrees of thought leadership, larger productions allow you to position your brand as a reliable resource for superb ideas. By continuously sharing small bites of information, you would likely be considered a news maker by the audience. Both positions are attractive in their own right, but businesses which have the capacity to create and share short, informative posts on a daily basis are more inclined to go the feathers route. Those brands that simply cannot provide entertaining, enlightening and/or educational content on a daily basis (e.g. law firms, insurance companies, some medical facilities, etc.) should focus more on building bricks for the purpose of conveying their value to prospects and influencers. Video series, graphic illustrations and even research reports have a greater chance of becoming evergreen compared to your everyday tweets and Facebook posts. One key reason to consider incorporating more bricks into your content mix is their propensity to attract high quality and relevant links, a “must have” for any organization focused on improving activity from natural search. To a lesser degree feathers can be utilized more as a social signal or as a link to key content on your website/blog. If shared by key influencers, shorter posts can have a noticeable impact. Simple posts merely demand the attention of a dedicated community manager to create and measure impact. Bricks, on the other hand, are typically more involved. Due to the various skills required to produce an event, a podcast, a high quality infographic or a mobile application, you could potentially include creative, technical and other marketing resources in your development process. One potential issue with bricks is that there is really no way to predict what will resonate. Your organization may have research to support that there is a demand for a specific piece of content within a particular medium. However, there are no guarantees that your bricks will generate interest, links, traffic, leads, sales, etc. Thanks to the time and resources needed to create bricks, there is a much higher opportunity cost when compared to feathers. Success for feathers is often gauged by how many audience members saw a posts and, more importantly, how many of those people actually took some action (i.e. clicked or shared). In addition to those important metrics, you may find other crucial means for reporting the impact of bricks such as downloads of content, number of event attendees, leads collected in exchange for access to content and so on. Does your organization (or do your clients) produce both bricks and feathers? How do you determine what kinds of content to produce? What methods do you utilize to manage production and promotion of all that you create?